Instant downloads of all 942 LitChart PDFs (including The Lady or the Tiger?). Welcome to the LitCharts study guide on Frank Stockton's The Lady or the Tiger?. Created by the original team behind SparkNotes, LitCharts are the world's best literature guides. A concise biography of Frank Stockton plus historical and literary context for The Lady or the Tiger?. 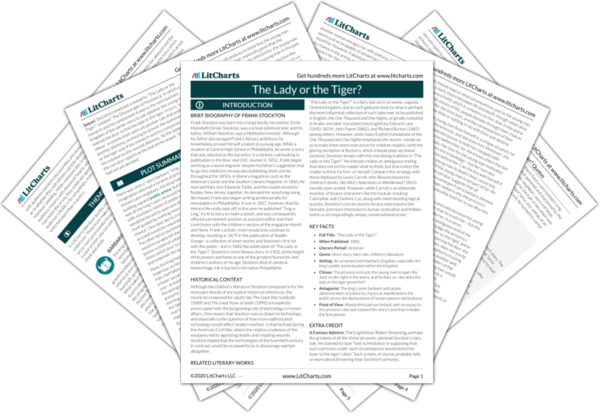 A quick-reference summary: The Lady or the Tiger? on a single page. In-depth summary and analysis of every of The Lady or the Tiger?. Visual theme-tracking, too. Explanations, analysis, and visualizations of The Lady or the Tiger? 's themes. The Lady or the Tiger? 's important quotes, sortable by theme, character, or . Description, analysis, and timelines for The Lady or the Tiger? 's characters. Explanations of The Lady or the Tiger? 's symbols, and tracking of where they appear. An interactive data visualization of The Lady or the Tiger? 's plot and themes. Get the entire The Lady or the Tiger? LitChart as a printable PDF. Historical Context of The Lady or the Tiger? Although the children’s literature Stockton composed is for the most part devoid of any explicit historical references, the novels he composed for adults like The Great War Syndicate (1889) and The Great Stone of Sardis (1898) are explicitly preoccupied with the burgeoning role of technology in human affairs. One reason that Stockton was so drawn to technology, and especially to the question of how more sophisticated technology would affect modern warfare, is that he lived during the American Civil War, where the relative crudeness of the weaponry led to agonizing deaths and crippling wounds. Stockton hoped that the technologies of the twentieth century, in contrast, would be so powerful as to discourage warfare altogether. Other Books Related to The Lady or the Tiger? “The Lady or the Tiger?” is a fairy tale set in an exotic, vaguely Oriental kingdom, and as such gestures back to what is perhaps the most influential collection of such tales ever to be published in English, the One Thousand and One Nights, originally compiled in Arabic and later translated into English by Edward Lane (1840, 1859), John Payne (1882), and Richard Burton (1885), among others. However, while many English translations of the One Thousand and One Nights emphasize the stories’ morals so as to make them more instructive for children readers (with the glaring exception of Burton’s, which instead plays up sexual content), Stockton breaks with this moralizing tradition in “The Lady or the Tiger?” He instead creates an ambiguous ending that does not tell his reader what to think, but that invites the reader to think for him- or herself. Compare this strategy with those deployed by Lewis Carroll, who likewise leaves his children’s books, like Alice’s Adventures in Wonderland (1865), morally open-ended. However, while Carroll is an elaborate inventor of bizarre characters like the hookah-smoking Caterpillar and Cheshire Cat, along with mind-bending logical puzzles, Stockton’s stories tend to be less interested in the fantastic and more interested in human motivation and foibles, told in a correspondingly simple, conversational prose. Key Facts about The Lady or the Tiger? Climax: The princess instructs the young man to open the door on the right in the arena, and he does so—but does the lady or the tiger greet him? Extra Credit for The Lady or the Tiger? A Famous Admirer. The Englishman Robert Browning, perhaps the greatest of all the Victorian poets, admired Stockton’s fairy tale. He claimed to have “had no hesitation in supposing that such a princess under such circumstances would direct her lover to the tiger’s door.” Such a claim, of course, probably tells us more about Browning than Stockton’s princess. Wilson, Joshua. "The Lady or the Tiger?." LitCharts. LitCharts LLC, 21 Jul 2015. Web. 20 Apr 2019. Wilson, Joshua. "The Lady or the Tiger?." LitCharts LLC, July 21, 2015. Retrieved April 20, 2019. https://www.litcharts.com/lit/the-lady-or-the-tiger.